Let's face it. Toddlers can get a little rambunctious at dinner time (make that all the time). But you no longer have to duck for cover from a flying bowl of macaroni and cheese. To help minimize mealtime messes, Munchkin created these ultra handy Stay-Put Suction Bowls. Whether you’re serving up a snack or a larger meal portion, three different bowl sizes will work for any hungry toddler. A stay-put bowl is one less thing for you to worry about when your baby starts self-feeding. More suction equals less mess. One piece design means: easier to clean, no parts to lose, and less chance of a bowl of food flying across the kitchen. Munchkin has you covered for infant and toddler feeding! 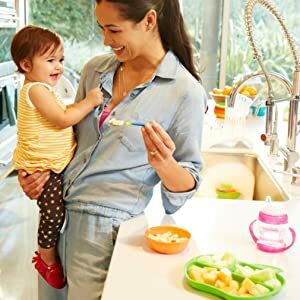 Don’t forget about utensils, tableware, sippy cups, and great cleaning products that all make life easier for mom and baby. Our innovative designs, and great values are why Munchkin products are top sellers all around the world. We believe that snacking should be fun, and each mealtime is a great way to connect with baby. It’s the little things. Safety warning Keep food on the table and off the floor with our Stay Put Suction Bowls. Each one of these toddler bowls has a strong suction base that affixes it to the table or high chair tray. 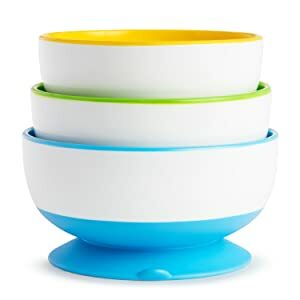 Tough for kids to lift and throw, but easy for grownups to remove and clean, these bowls will keep your child's food in place - and your broom in the closet.